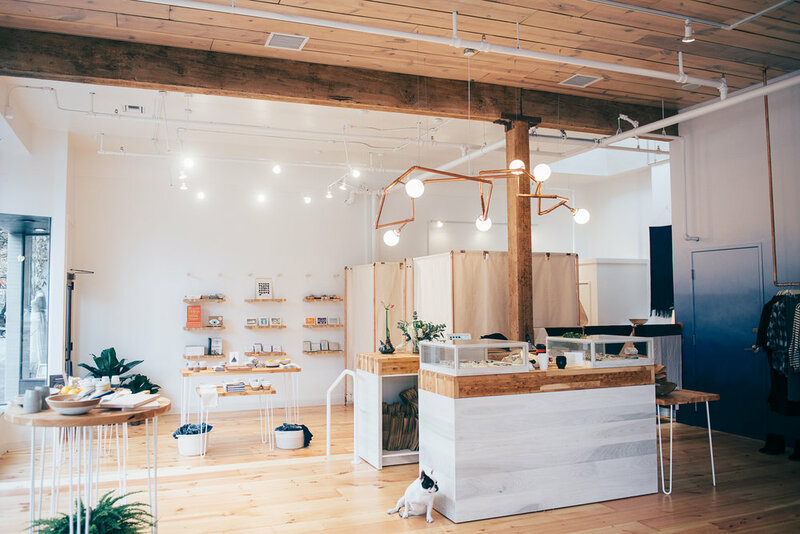 Whitney owned WM Goods, a beautiful shop in Portland focused on mindful design, and she was a massive inspiration for me when I started out with Inner Light. I met Whitney while I was working for Mary MacGill Jewelry, and I immediately fell in love with her and her space. Seeing a young, female business-owner with a shop that I admired for its aesthetic was inspirational for me and it helped me believe that I could open my own space some day. Even when designing Inner Light, I looked to WM Goods for ideas – I was tempted to copy her light wood display tables with white wire legs! Most recently, Whitney launched Well Made Consulting. She is leveraging her years of experience as a store owner and buyer to help brands craft authentic stories and strategies with everything from public relations to creative direction. To top it all off, she and her husband are expecting a baby girl this fall! Kelly: Hi Whitney! It was so fun to reconnect on social media recently. I have always loved WM Goods and you were such an inspiration to me in opening Inner Light. What are the most significant lessons you’ve learned as an entrepreneur in the retail space? Whitney: The lessons you learn as an entrepreneur are endless and constant. I think one of the biggest things is to remove ego from the equation. Some people will understand and love your concept, some people walk through the door in a horrible mood and are rude and criticize your work… it totally runs the gamut. You will also grow and at a certain point, won’t be able to have your hands in every component of the business. Learning to let go and trust your employees is a huge lesson. As a small business owner, I started out doing literally everything myself. Letting someone else in and handing over the responsibility was a big lesson in trust and realizing that I’m not anything ‘less’ because I can’t and don't do it all myself. Kelly: I completely agree with all of this! I had to hire a team and delegate earlier than I anticipated with my pregnancy but it was one of the best things that happened for the business. I’d love to know how did the idea for Well Made Consulting came about and it’s been to launch this new venture? Whitney: Interestingly enough, I had no background in retail when I opened the shop. My career has been focused in PR, marketing, branding, brand strategy, and events. I worked in NYC and LA for years both at agencies and in-house for fashion brands large and small. I really missed the collaborative effort of helping someone else grow their business. A few friends asked for help on their own projects, and it sparked something in me where I realized that between my previous life in PR/marketing and my current life as a small business owner, I had something to offer. I started Well Made Consulting just over a year ago and it naturally evolved into something consistent & real, which has opened my eyes to an entirely different world outside of retail that I’m really excited about! I’ve helped brands with everything from clarifying their messaging and creating a consistent voice & visual aesthetic, developing full branding including a logo, website, copy and personality, event & media support for store openings, setting up a showroom and e-commerce business, and so much more. I love the diversity of the job and that each project is completely different. Kelly: I have such deep admiration for you in general, and especially in this transition from store front to consultancy. It is so brave and inspiring to see someone stepping into the next part of their journey with so much grace. How has this process been for you? Whitney: Yes, I’m in a true period of change in many regards and am so excited about it all. I decided to close WM GOODS for a number of reasons, the biggest of which being that I just realized that I was more passionate about my consulting work and certain aspects of the shop than retail itself. Retail is no joke and you have to be extremely passionate about it to make it work long-term, as there infinite ups and down. Closing the shop and focusing on WMC had been in the back of my mind, and once I found out I was pregnant, I took it as a sign. I have absolutely loved creating the shop environment, developing events that connect creative people, and sharing the work of makers I truly believe in. These are all things that I want to bring into the next iteration of my business. I just crave more flexibility, less overhead, and have recently had a real desire to not be confined to a physical space. I’m sad to let it go but I also feel like I did what I aimed to do with it and look forward to the next chapter. Kelly: What is your mission for Well Made Consulting – how do you want brands to feel and experience from working with you? Whitney: My goal with Well Made Consulting is to serve as an advisor and trusted resource for brands. While my background is primarily in fashion & retail, the skills I have serve other industries as well and I love that it’s all about collaboration and sharing what I know to help someone else. I’m very honest and open, and hope that my insight provides a support system for brands that are either just starting out or need a fresh set of eyes on their work. Kelly: I love that, your clients are so lucky to have your expertise and passion in their corners! Congratulations again on your pregnancy! How are you feeling thus far? What has surprised you the most about being pregnant? Whitney: Thank you so much! It’s been a very interesting journey already, and I’m only in the early stages of my second trimester! Generally speaking, I’m feeling really good. There have been ups and downs for sure. I actually found out I was pregnant a few days before I was leaving for Israel and then came home briefly before heading on my honeymoon to Europe (my husband and I got married September ’17 and took forever to plan it out!) Needles to say, we had to approach our days abroad a little differently with my nausea and bizarre heat stroke/fatigue. My husband is a trooper! Beyond the physical stuff, I had a week or two with really intense emotional lows and anxiety, amplified by the fact that I was working towards closing my business. I’m taking it all day by day and working really hard to listen to my body and do what I need to do, whether it’s reading, prenatal yoga (I don’t ever do yoga so this was a big one for me!) or walking. Kelly: Listening to yourself is so important. It is not easy to be a pregnant small business owner, at least in my experience! Can you tell me a little more about what it’s been like to have both your businesses to run while growing your babe? Whitney: You’ve definitely been through it!! The first trimester I had to play the jet lag/not feeling well card a lot, as I wasn’t quite ready yet to let my employees or friends know about my pregnancy. I am lucky that I have a great team in the shop that hold down the fort a few days a week, and I’ve learned to use those days to work from home and do what I need to do. When I’m working in the shop, there’s no real flexibility since we have set hours and people come in at any moment, and you always have to be ‘on’, even when you’re feeling way less than ‘on’. Of course, planning ahead is difficult as each pregnancy, birth, baby and mama are so unique and you don’t know how it’s going to be until it happens! But what are you looking forward to in motherhood and how are you feeling about being an entrepreneurial mama? My husband and I have been talking a lot about the lifestyle that we want to have and the environment we want to create for our family. Our priorities are creative fulfillment, community, friends/family, food, nature, and exploration. I’m excited to use my consulting work to engage more with these priorities. Outside of my work with other brands, I’m interested in creating opportunities for women to connect through meet ups that center around these tenants. We’ll see where that leads! Let the journey begin!